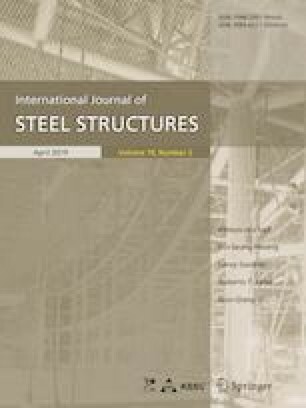 Eight stiffened T-shaped concrete-filled steel tubular (CFST) columns and one non-stiffened T-shaped CFST column were tested subjected to axial compressive load in this paper. The mechanical property and failure mode of the specimens were studied. The influences of steel ratio, concrete strength and sectional size were investigated on the axial compressive performance of the specimens. A numerical program was developed to calculate concentric load-shortening curves of T-shaped CFST columns based on experimental results. The confined concrete distribution in T-shaped section and the stiffened tube’s local buckling were considered in the numerical program. A good agreement between calculating results and experimental results was obtained. Besides, a design formula of bearing capacity of stiffened T-shaped CFST columns was put forward by considering favorable effect of stiffeners. This study was funded by the National Key Research and Development Program of China (Grant Nos. 2016YFC0701201 and 2017YFC0703805), Research and Development Project of Ministry of Housing and Urban–Rural Development (Grant No. 2014-K2-010) and the Fundamental Research Funds for the Central Universities (Grant Nos. 106112014CDJZR200001 and 106112015CDJXZ208804).